The suave chai at Château de Fieuzal was completed in 2011. Fieuzal might not have the name cachet of some of its immediate neighbors in Pessac, such as Smith-Haut-Lafitte or Haut-Bailly, but that doesn't stop it from producing ample quantities of top-flight red and white wine. "And that's what Bordeaux can do. We can produce quantities of excellent wine here," said Stephen Carrier, de Fieuzal's general director. "They can't do that in Burgundy or places like that. They make great wines, but small amounts. 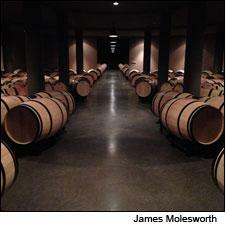 Bordeaux's strong suit is quantity and quality." Carrier knows a thing or two about producing large quantities of excellent wine, having worked at Lynch Bages in Pauillac from 2001 through 2005. Carrier, along with consultant Hubert de Boüard of Angélus, joined de Fieuzal in 2007 when owner Quinn Lochlann decided to change his entire winemaking team. Lochlann, an Irishman and friend and fellow banker of Haut-Bailly's owner, Bob Wilmers, bought Château de Fieuzal from a bank in 2001. Bank-owned since 1993 at the time, Carrier noted how the culture needed a change. "There's quantity and quality, and then there's just quantity. Obviously, with the bank owning it, it wasn't about investment, or changing or improving, it was just about cash flow. So when I got here, some of the vineyards were a little worn out," said Carrier, alluding to the penchant for higher cropping during the previous ownership. "Luckily Mr. Lochlann doesn't care so much about the return, but he does care about the wine, and he says 'Do what you need to do, just make good wine,'" said Carrier. Among Carrier's first changes were to rip out 25 acres of red and white vines each, to make the estate a bit more manageable. And as older vines are replaced, Carrier ups the density of new plantings to 2,800 vines per acre. Today the estate's 198 acres of vines are divided up among 65 parcels, covering light sandy gravel mix at the top of the rolling bumps in the vineyard, with pure sand in the lower parts. There are 25,000 cases of red wine produced here and 3,000 cases of white on average, split between the grand vin and second wine, Abeille de Fieuzal. In the cellar Carrier has a mix of large and small vats, including wood, cement and stainless steel. "Weather, yield, things are different every year in the vineyard," said Carrier. "And because of that I've learned it's best to have every tool possible in the cellar to help produce the best vintage." Carrier typically puts Cabernet Franc and Merlot in steel, with Cabernet Sauvignon and Petit Verdot in cement or oak. The chai was renovated in 2011, providing more room and functionality as Carrier works with increasingly smaller lots based on the vineyard parcels. "In 2014 I have 45 lots of wine. I want more parts so that I have as many options as possible for the final blend," said Carrier. As for the 2012, Fieuzal was successful, along with Pessac in general. "I love the red in '12," said Carrier enthusiastically. "It's not '10 of course, but it's balanced, not extracted and very pure. It's a fresh wine to drink now and with some time. The white is delicious too, drinking well now, which is good because you need to wait for '11 and '13 whites to mature." Fieuzal typically retails for around $40 at U.S. retail, the second wine at about $30, proving that Bordeaux can not only produce excellent wines with excellent quality, but isn't always exorbitantly priced either.